Groovy's Star Wars Jedi Slippers are just the thing to keep your feet warm on a winter's morning, Sadly, as I'm usually a size 11 in footwear, these little beauties were too small for me (and believe me, in true Ugly Sisters style, I tried to cram my giant feet into them), but my better half has teeny tiny size 5 feet and they fitted her a treat, much to her great pleasure - she's been rubbing it in by marching up and down the room humming 'The Emperor's Theme'. 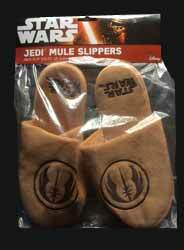 I'm reliably informed that popping your feet into these is like slipping them into a warm tauntaun - they're fluffy, making your feet lukewarm (Luke warm, geddit? Oh, please yourself). 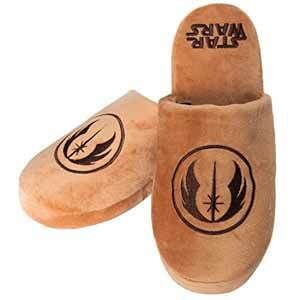 There are plenty of other styles in this slipper range but none (other than the black Empire variety) is as subtle as these. If you want to keep your inner nerd hidden, these will do the trick, as only a Star Wars fan will understand what the logo is all about.